The Qazi community derive their name from the term qadi which means "judge." They have a tradition of being the religious leaders or imams among the Muslim groups. 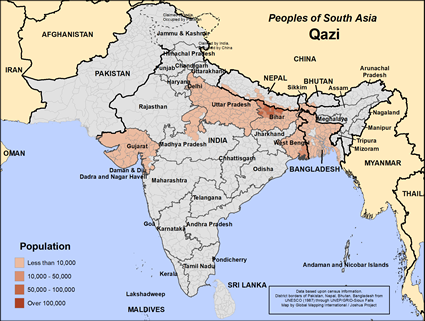 The majority of the Qazi live in Bihar, India but a good number in Nepal live in the Maithili speaking areas of Narayari and Janakpur zones. They live primarily in Bihar, Gujarat and Rajasthan. In the latter they live mainly in Sikar, Churu and Junjunu. A number also live in Bangladesh. The Qazi are skilled in art of Islamic religious rites and tend to perform the traditional ceremonies for the greater Muslim community. They perform the birth, purification, marriage, death and burial rites. 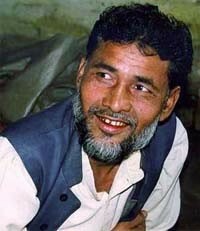 The Qazi are Muslims of the Hanafi tradition and virtually 100% Muslim in India, Nepal and Bangladesh. In India Urdu is the mother tongue of the over 450,000 Qazi and they can speak other local languages in their context. In Nepal the Qazi primarily speak Maithili. They enjoy a higher than average social status because of the general and religious education. The Qazi are Sunni Muslims of the Hanafi tradition. They faithfully follow the Muslim practice of praying five times a day. They also fast during the month of Ramadan as do most Muslims. Some also celebrate Hindu festivals and traditions as well as participating in animistic rituals. There is a need for education. There is also a lack of employment among them. The Qazi are a very strategic community to bring to faith in Christ as they would be natural spiritual leaders as followers of Isa. Terrific influence among many Muslim groups could be made if a Qazi man were able to remain in the community and be a Christian Qazi leader. With Christ all things are possible! Singh, K. S., ed. "India's Communities A-Z", Oxford University Press, USA 1999View Qazi in all countries.